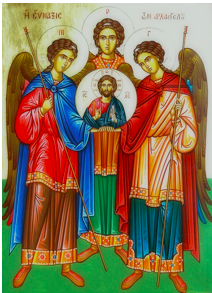 In Catholic tradition Michael, Gabriel and Raphael are called archangels. The word archangel comes from the Greek words arche meaning prince and angelos meaning messenger. In other words, God’s main messengers among the angels. Michael means "Who is like God?" Gabriel means "Power of God" or "Strong One of God" and Raphael means "God has healed". Michael, Gabriel, and Raphael are named in the Bible as angels. We have strived to attain this goal this term. Let's continue to spread the Gospel message in our words and actions over the holiday. Happy and safe holidays to you all. Pies and Milo - this week was the last week that the Home and School were coordinating the pies and milo as it was only been done in the winter terms. Thank you to the parents and Mrs Marsh for helping make this a tasty treat on a Wednesday. We have a huge collection of lost property by the sports notice board. Please have a look through and collect your belongings. 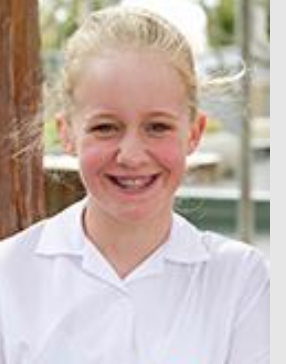 We are having our school photos on Tuesday 17th October (first Tuesday back) in their summer uniforms. Family photos will be taken from 8.15 am to 9.00 am in the hall or the junior school playground. Class photos will be taken from 9.00 am. It has sprouted and is looking good. It has been a productive term giving the garden a good weed and starting to plant out for spring. New entrants made a great job of planting garlic. Lots of 'little gardens' have been kindly donated by Northside New World and parents. 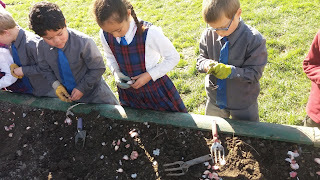 Students have taken them home to join in on a competition to upload a photo of their seedling being finally planted out with lots of spot prizes for best seedlings. I will post more details next term. This week students will plant out lots of organic seedlings donated by the Waitaki Community Gardens. 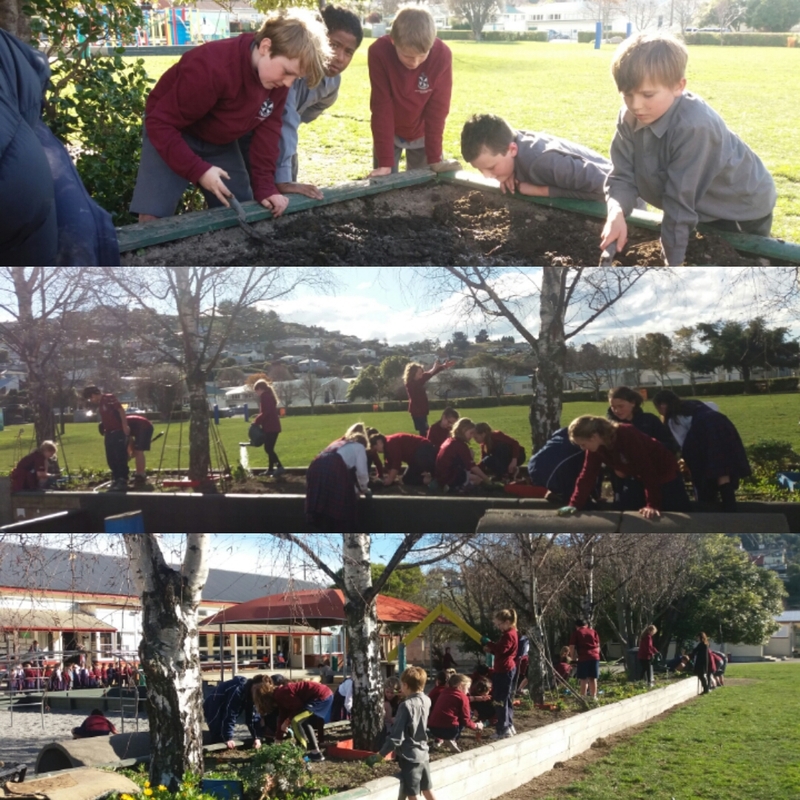 If you would like to volunteer to work in our school garden or water the garden over the holidays, contact Bianca (School Gardens Coordinator) on 021 268 4063. 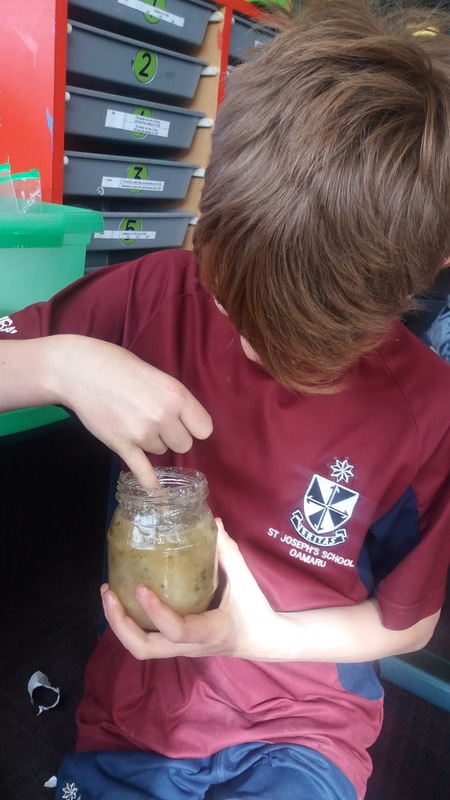 Year 4's try their sage herbal honey which they made. It has been in their sunny window brewing away and they mixed it up and tried. Yummy was the consensus. Year 4's also made a beeswax and marigold oil balm which they got to take home. Touch Rugby - There is a notice further down the blog regarding touch. Cricket - Mrs Brien has collected names of children who wish to play cricket next term for school from Yr 1 to Yr 7. Further information will follow. Cricket competition starts after Labour Weekend. Mrs Whiston will open the Uniform Shop on Monday 16th October at 8.30 am. 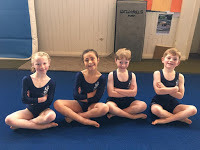 We warmly welcome back Jayla Strong to our Yr 5 class. Rainbow Run Sport Waitaki are holding the Rainbow Run again this year on Saturday 14th October at Oamaru Racecourse at 10.30 am. The course is 5 km with shorter options. You can run or walk it. Balance bikes and prams can go on the course at your own risk but sorry no dogs. The colour powder used can wash off clothes and bodies easily. Individuals cost $10, Family (2 adults and 2 children) cost $30, extra children $5. America's Cup Carnival - Sunday 15th October hosted by the North Otago Yacht and Power Boat Club. Starts at 1.00 pm with free entry. Meet and Greet with the Cup and members from the team from 5.00 to 7.00 pm. There is kids fishing competition, food stalls, competitions, entertainment, free train running all afternoon from Scotts Brewery.